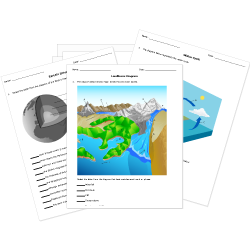 You can create printable tests and worksheets from these Grade 12 Atmosphere questions! Select one or more questions using the checkboxes above each question. Then click the add selected questions to a test button before moving to another page. Which is caused by strong winds picking up moisture over warm water? In which layer do virtually all weather phenomena take place? What does the Coriolis effect do to hurricanes? What direction do Westerlies blow? What is the main gas component of the atmosphere? Approximately what percentage of the solar radiation that is incident at the top of Earth's atmosphere actually reaches the Earth's surface? Which is a powerful funnel of air associated with lighting, high winds, and rain and hail? You are sitting on the beach at 12:00 a.m. in the morning, the breeze is blowing and you look at the flag over the lifeguard shack. It is most likely the wind will be blowing in which direction? In the Pacific Ocean, hurricanes are generally called typhoons and in the Indian Ocean, hurricanes are called tropical cyclones . The eye is the calmest part of the hurricane. Give the name of the hurricane that occurred in New Orleans in 2005.